Nyan Cat The Game is a free arcade game app for Windows 8 and 8.1 computers. First a YouTube video, then an internet meme, and now A Game. Yes, we are talking about Nyan Cat. This Arcade game for windows 8 took out Windows 8 from cliché of heavy games. This is an easy to install, easy to run, and easy to play game. This game has attracted crowd of almost every age group towards itself. 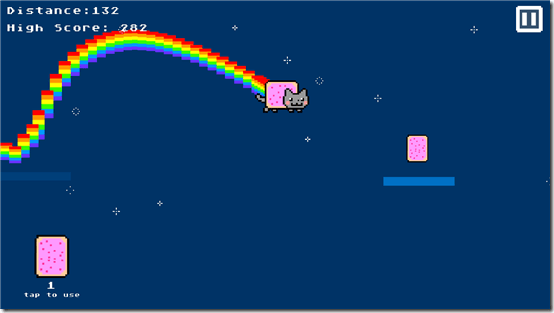 The game is all about a cat Nyan, who leaves rainbow trails in sky, while jumping from one tile to another. The player has to make sure that the cat remains in game, and does not falls down. You can find this game easily on the Windows 8 store. This game does not occupies much space. This light game requires only 11.5 MB on your computer’s disc. Find the game on the store, or just click the Download link at the bottom of this article. The game control is quite easy. This Windows 8 Arcade game is fully controlled by mouse clicks. The Left mouse click will make the cat to jump once. 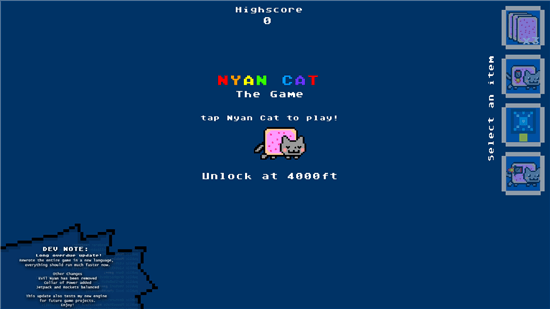 A maximum of two jumps is possible, until the Nyan Cat lands on a tile. Once it lands on a tile, you can make the Cat jump again for two times. 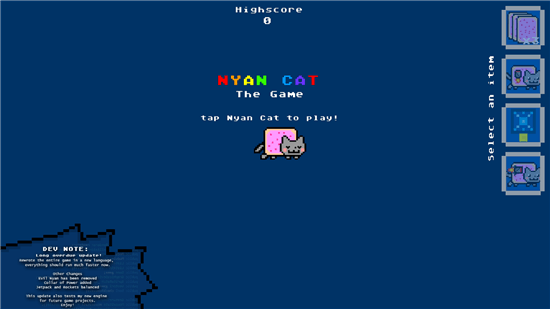 The game gets over, once the Nyan cat is not able to land on a tile. There is no option for setting the difficulty level in this game. The difficulty level will increase, respective to the number of tiles crossed. More the tiles crossed, more faster will be the gameplay. Pink boxes appear while you play the game; collecting these pink boxes will give your Nyan cat, an extra life. The game does not have any levels, but there are four items in this game, which makes the gameplay easier, and more entertaining. You can unlock these items by achieving different heights. This game has an auto save feature, which means it will save your high scores. This beautiful Windows 8 Nyan Cat game has no end, so every time you play, you get to challenge your own high score. The graphics of this game are minimal, but catchy. This game is a pretty good, and impressive download for Window 8 and 8.1 users. This is a fun filled game, which is not too heavy, and a good entertainer. And if you are Nyan Cat lover, you definitely need to get this Nyan Cat game for Windows 8. Download Nyan Cat The Game for Windows 8 and 8.1.